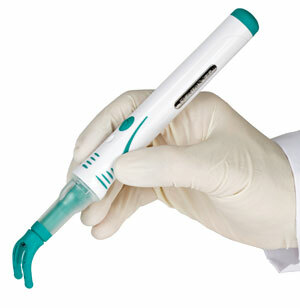 The DentalVibe causes the tissues around the injection site to vibrate while anesthesia injections are administered. Research has shown that when vibration and injection sensations are occurring simultaneously, the vibration feeling reaches the brain first and essentially blocks the feeling of the injection from being perceived. Needle fears keep many people away from the dentist. Postponing dental procedures because of these fears is common, but ultimately results in worsening problems and other serious oral health concerns. 95% of the patients that have experienced the DentalVibe say that it has changed their view on going to the dentist. Children and adults no longer have to be afraid of the needle.